One strain does not fit all. There are strains that are specific for anxiety and strains that are targeted for insomnia. You wouldn’t want to take a strain that is meant for deep and restful sleep when you needed to interact and function with friends and family. Likewise, ingesting a strain that is meant for social interaction and creative problem solving when you really just want to get some sleep would not be your best choice. Most of the seniors I talked to didn’t know the difference between an Indica strain and a Sativa strain. And Indica is more sedating to the body and mind while a Sativa is much more elevating and energizing. Even when one finds a marijuana strain that consistently works for them, it can be advantageous for seniors to try different strains because tolerance to the same strain has been known to build up. The narrative of the popular 1960s song entitled ‘Teach Your Children‘ by Crosby, Stills and Nash was for ‘parents to teach their children well’. 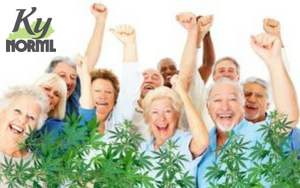 Today the children of the World War II generation (the so-called ‘greatest’ generation) are teaching their parents (and their fellow Baby Boomers) about the wonderful utility of naturally-produced, non-toxic medical cannabis to successfully treat and/or manage a wide-range of health ailments. NORML and High Times’ Medical Marijuana Magazine are the primary sponsors of the Silver Tour, a project of the nascent NORML Senior Alliance. The Silver Tour is championed by Robert Platshorn, one of America’s most successful cannabis smugglers and the nation’s longest serving cannabis prisoner (Robert served twenty eight years in federal prisons). The basic mission of the Silver Tour is to speak and present at any venues on the topic of medical cannabis where senior citizens are clustered in large numbers–notably at senior living communities, retirement homes, religious centers and hospice. One of the first public outreach events happened last week in Miami at a Jewish Community Center.